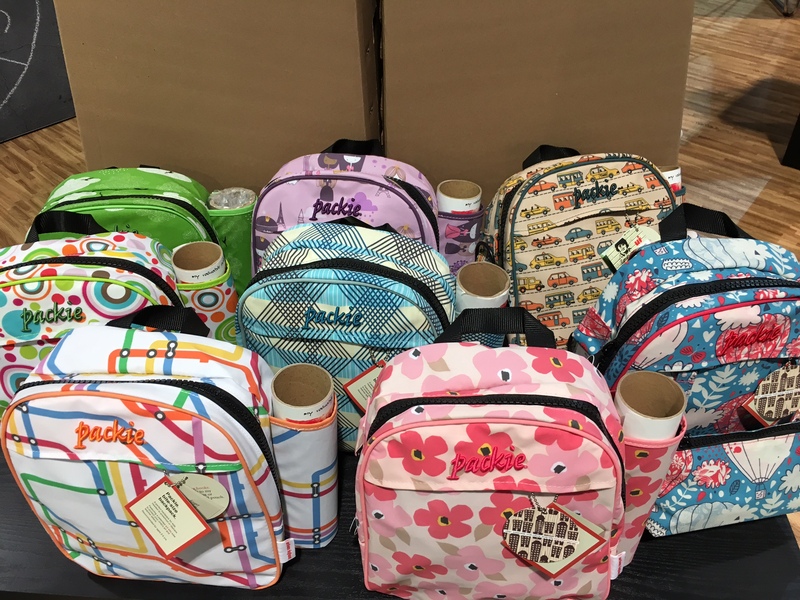 Can I just say that I am WOWed by the smorgasbord of products I saw at ABC Kids Expo 2016. I mean, seriously. There are some super awesome products that I was introduced to that made me think how genius it was. 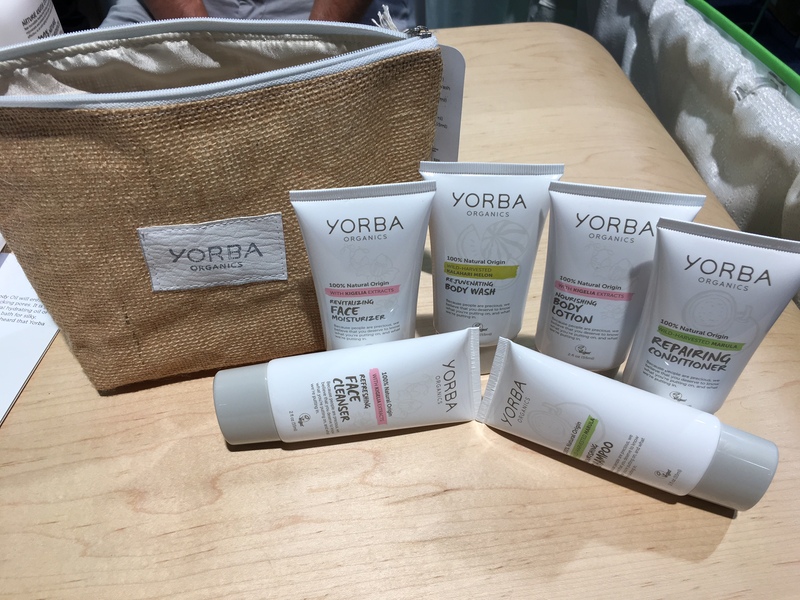 I took some pictures, and some videos to show you just how amazing these products are. Be on the look out for some of these items in 2017, as over half of them are scheduled to make their debuts in the Spring. These bottles are just so slick. From the design, color, and multiple uses (for cold or hot beverages). These containers are free from chemicals, and even kids can use them. They range from 12oz all the way up to 25 oz. 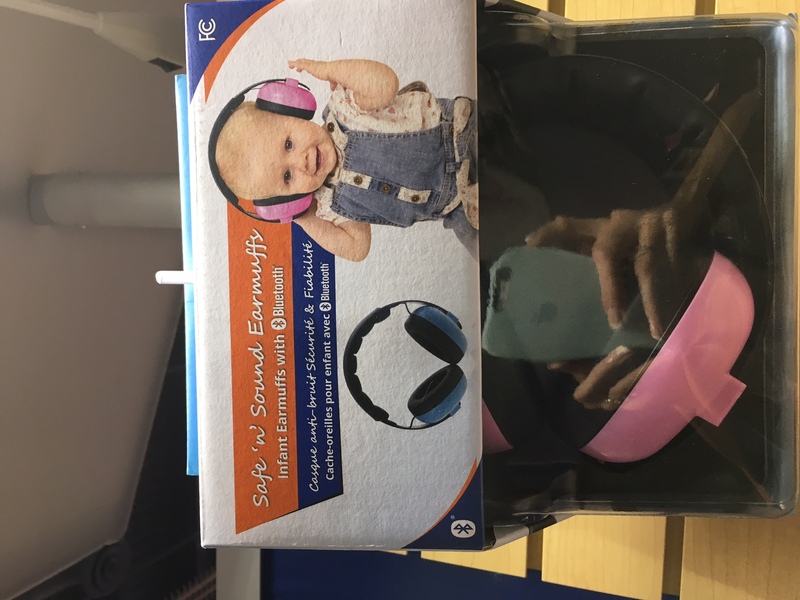 When baby is born, whether you have older kiddos or not, sometimes you just want to go places that may be too sensitive for your little squish’s ears. 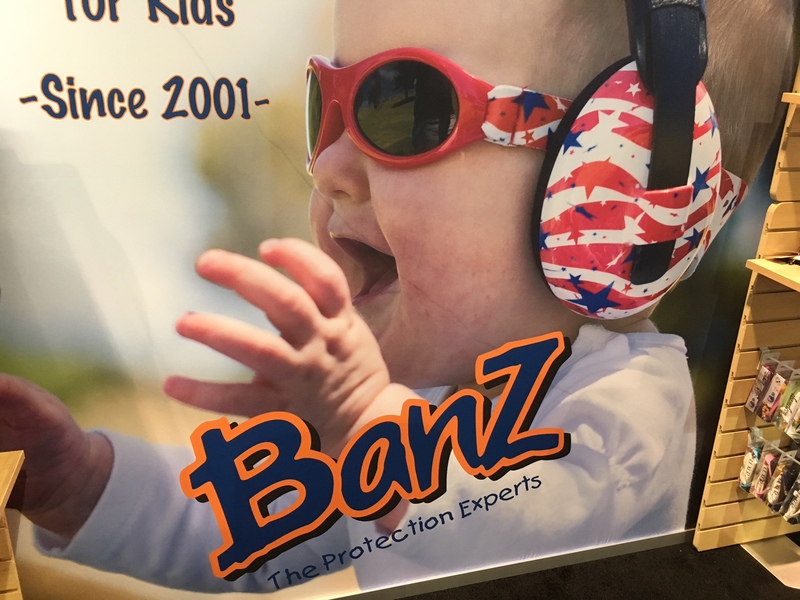 These Safe Surround Ear Muffs block out most of the sound. Did I mention that they are coming out with Bluetooth enabled ones so that you can use them with a viewing device (like an iPad/iPhone/Tablet) or play music via Bluetooth. I want an adult pair! THIS. Just THIS. 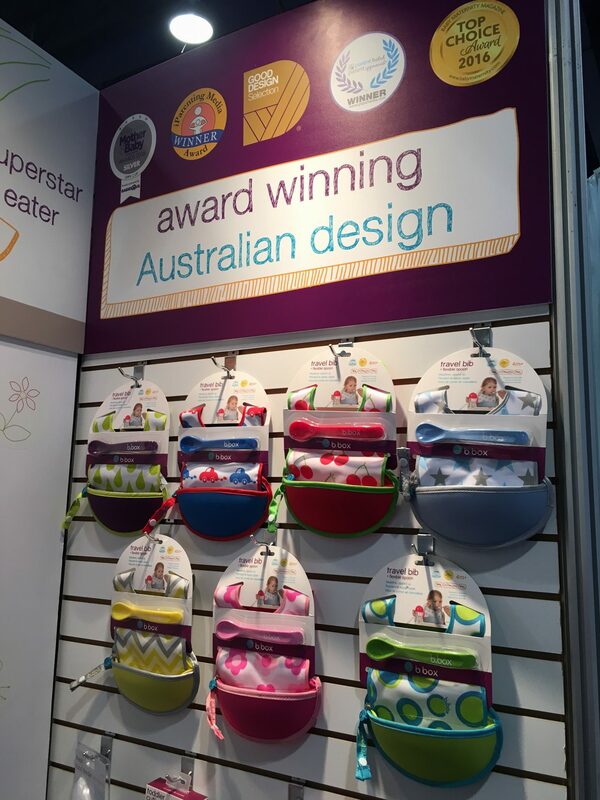 It is a travel bib that compresses into a “catcher”. This catcher will catch the food while baby is eating, but also will hold the dirty bib and spoon together for safe storing in your bag! No need to mess with baggies or wrapping the mess in a napkin. 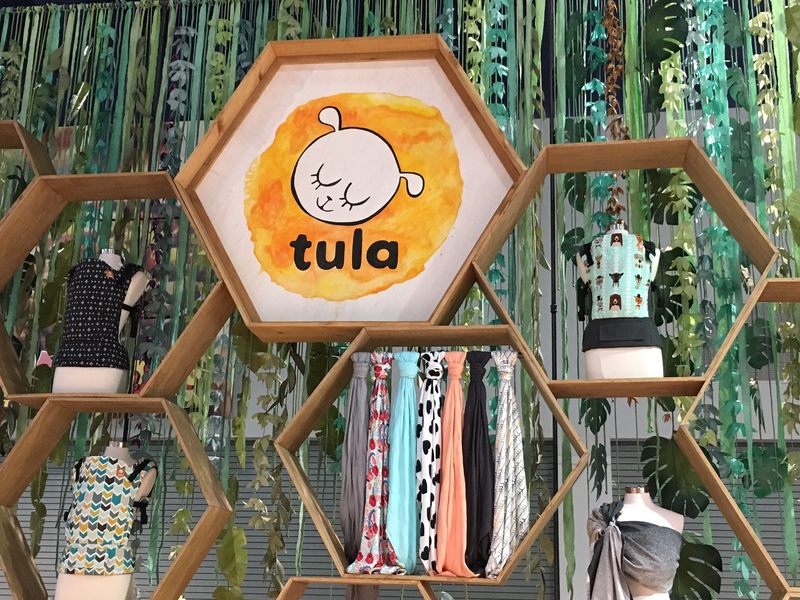 If you’ve never seen a Tula, open a new browser window and Google Tula. 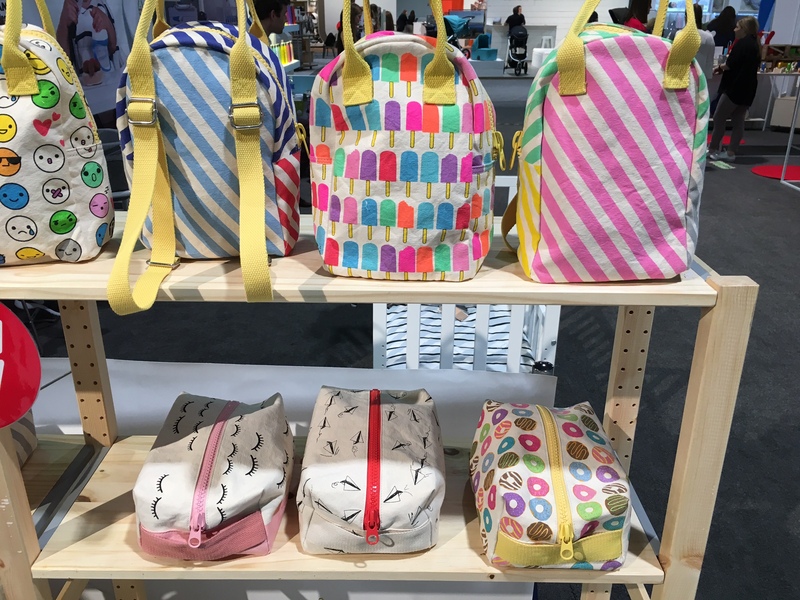 These carriers are so pretty and come in so many different prints and sizes (baby, toddler). Most of them come in canvas, although they are rolling out wrap-conversion ones (already made) as well as mesh. 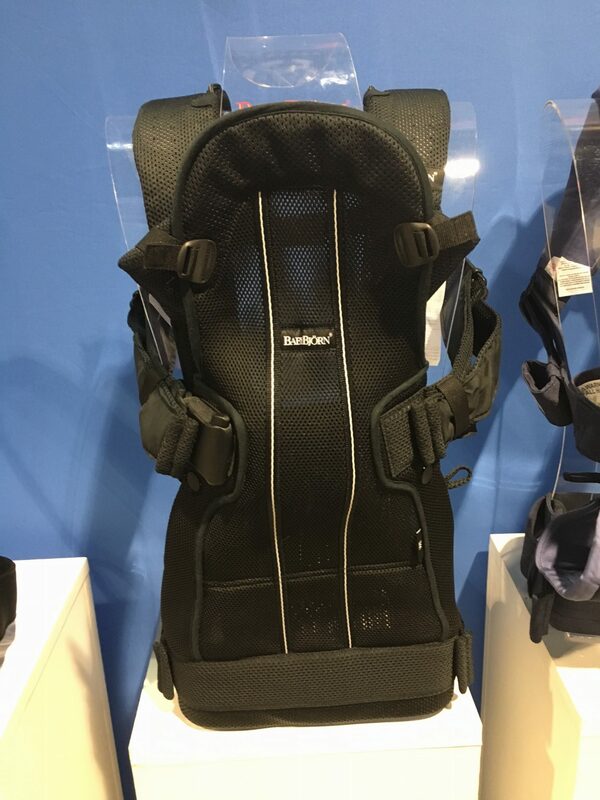 They can be used from 15-45 pounds (baby sized carrier) and 25-60 pounds (toddler carrier). Each baby blanket is made from 100% viscose from bamboo, making them SO soft. If there was a blanket in adult size, it would be wrapped around me every time I came home. These blankets come in the cutest designs and sell out each time they go on sale. 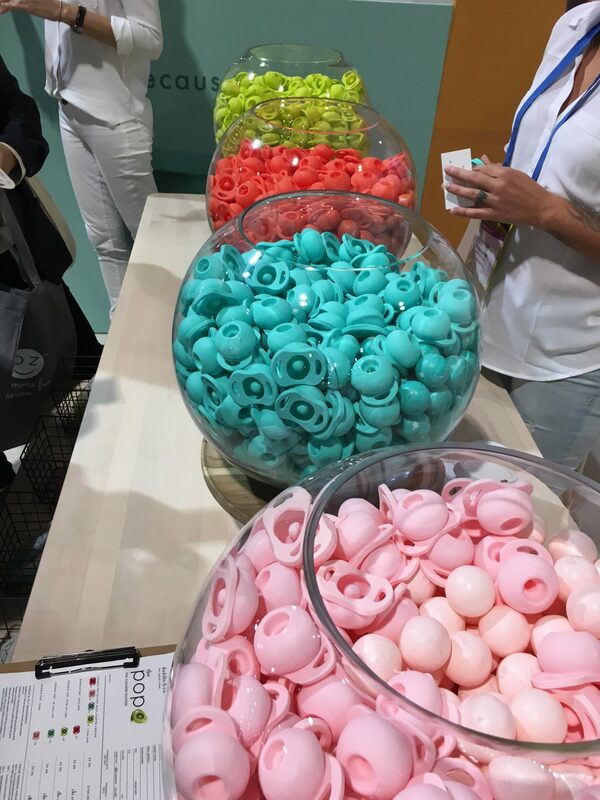 THE most colorful pacifiers I’ve ever seen. 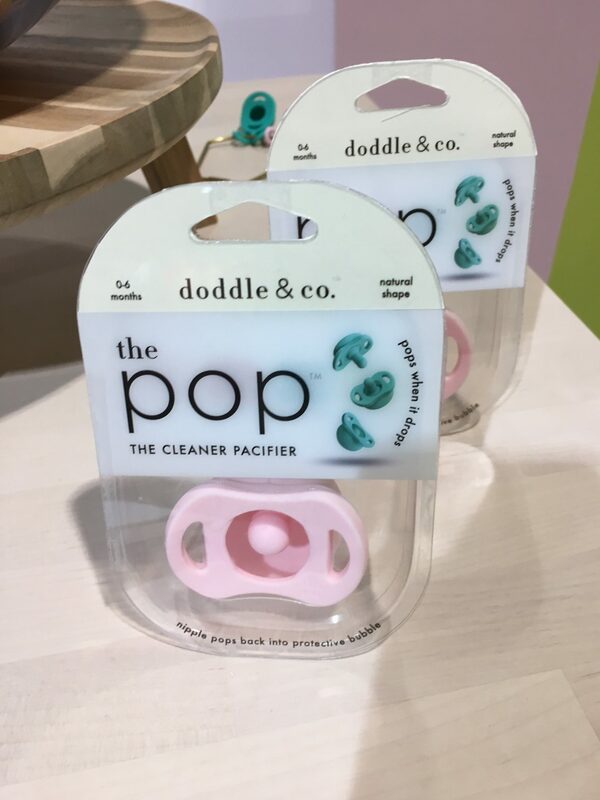 These pacifiers started as a Kickstarter campaign. It is a clean pacifier by popping back into its silicone sleeve once it’s out of baby’s mouth. It’s made of medical-grade silicone and is only one piece. I was pretty impressed with the Yoyo+ Stroller. It’s the first time I’ve ever seen or heard of it! It can be used from birth till 40 pounds, has great storage, and can be folded so compactly that you can carry it on an airplane. I mean, just look at this fold!! Here is a company that is thinking GREEN! 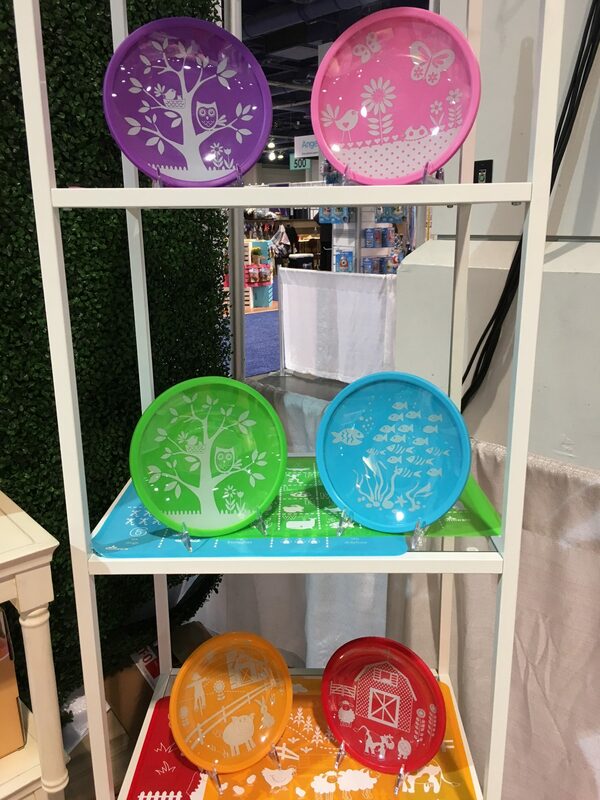 Re-play is a children’s tableware company that use recycled milk jugs to create fun and colorful tableware for kids that is completely affordable! 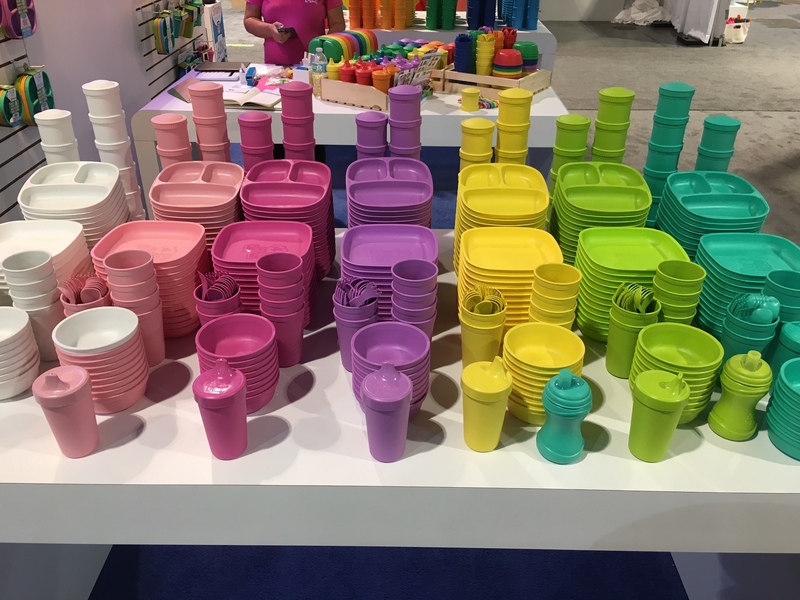 Tableware includes plates, bowls, cups, snack stacks, utensils, and much more! This one’s so new it’s not even up on the website yet! 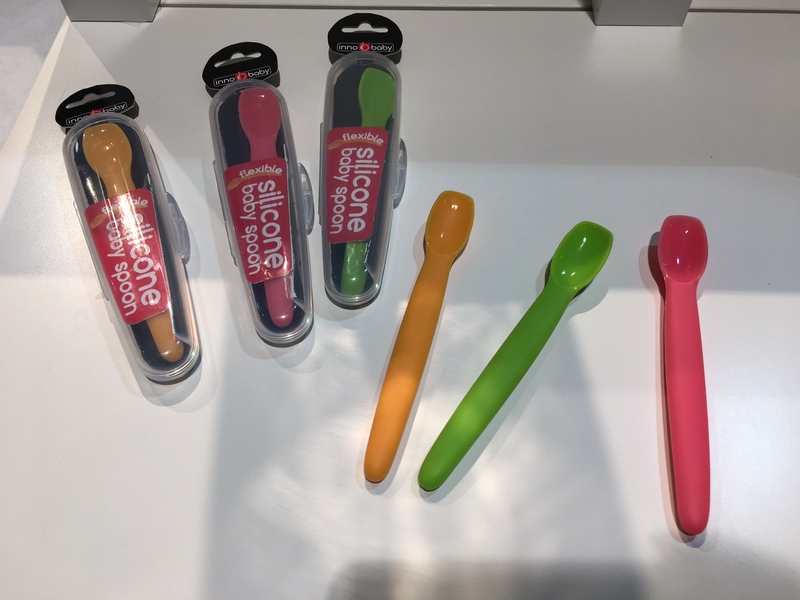 Coming in spring will be Innobaby’s silicone baby spoons. You can bend them, fold them, and fit them into the tiniest of places. Although you won’t need to with this super nifty case it comes with. 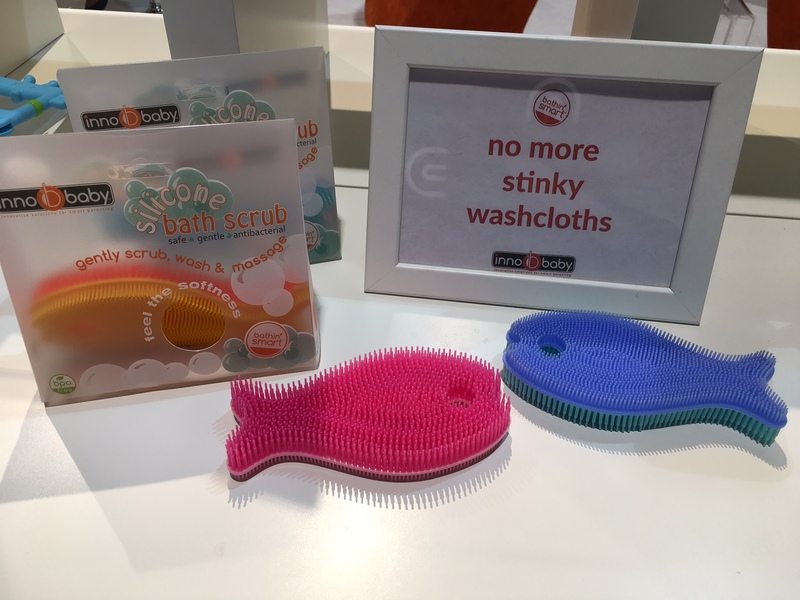 Scrub a dub dub… I’m stealing this for MY tub! How cute is this little fish-looking sponge. It’s super great for exfoliation, and the hole is perfect for little fingers to slip in for a firmer grip. They come in a super cute array of colors. We’ve all been there. Trying to figure out how to be more ‘on-the-go’ with foods that can’t quite sit well in a ziplock or snack bag. 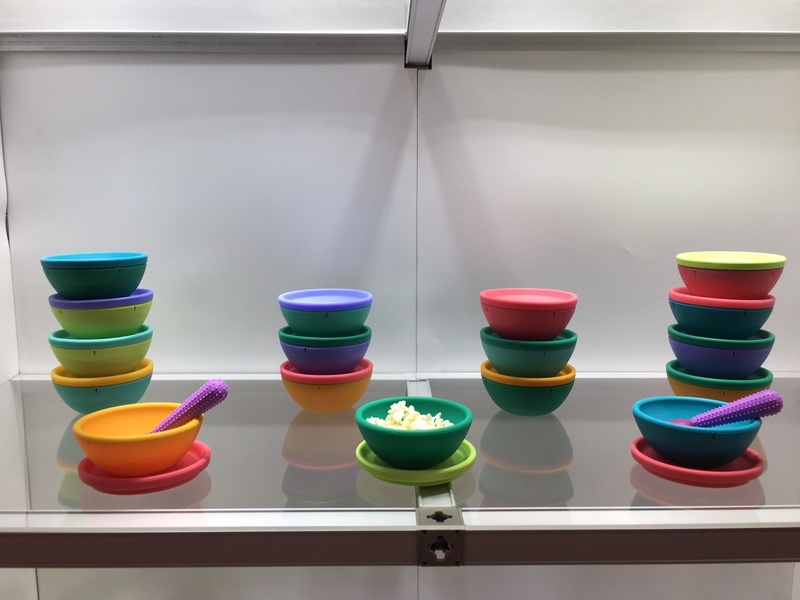 ENTER Silikids silicone bowls! 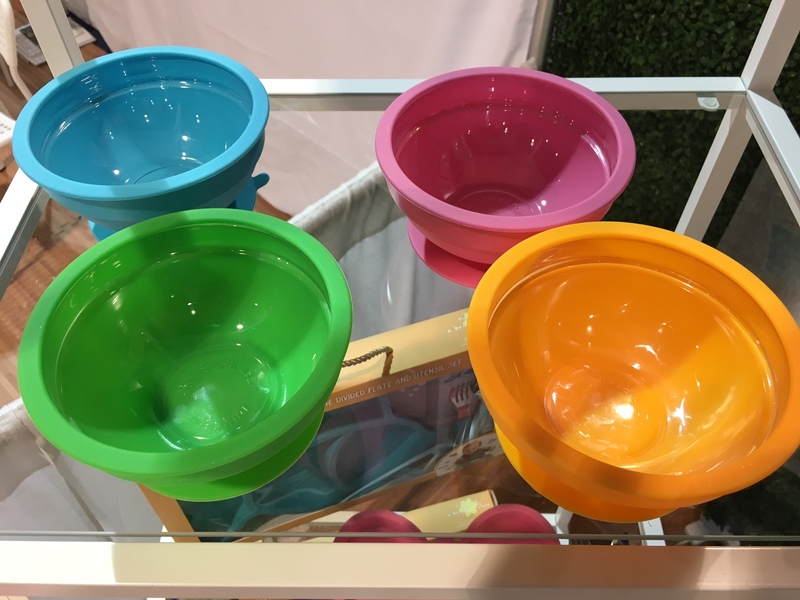 They come in an array of colors, and the top suction cups to the bowl and makes a pretty tight seal so you can take it with you! Plus, the top can be used as a plate when the two pieces are separated. Bonus – they are dishwasher and microwave safe! MIND = BLOWN. Of course I was drawn into the make-up bags that Fluf had to offer (hey, can you blame me?). But was enamored by the array of reusable tote bags they had! Check out the amazing designs and sizes coming soon to a shop near you! The more affordable SWELL bottle is now coming to a retailer near you. I mean, I get it. 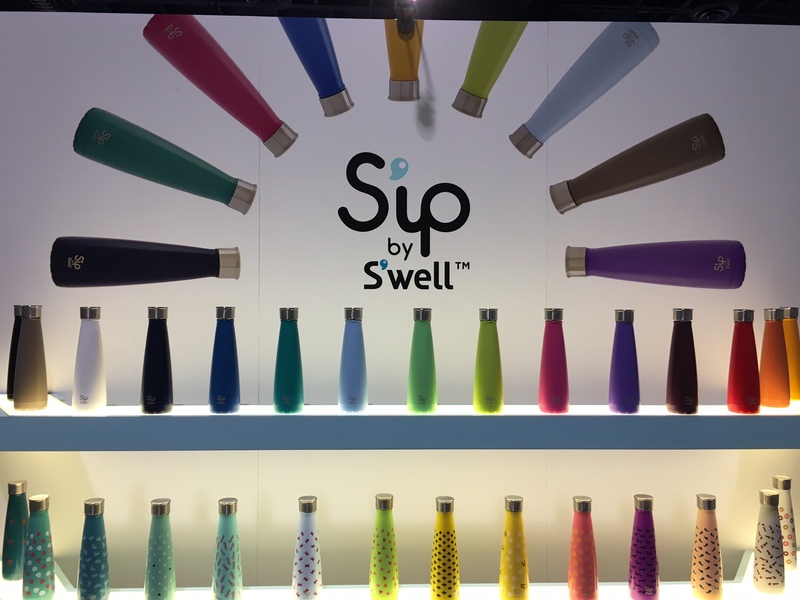 You see that S’well bottle’s price tag and gulp… literally. 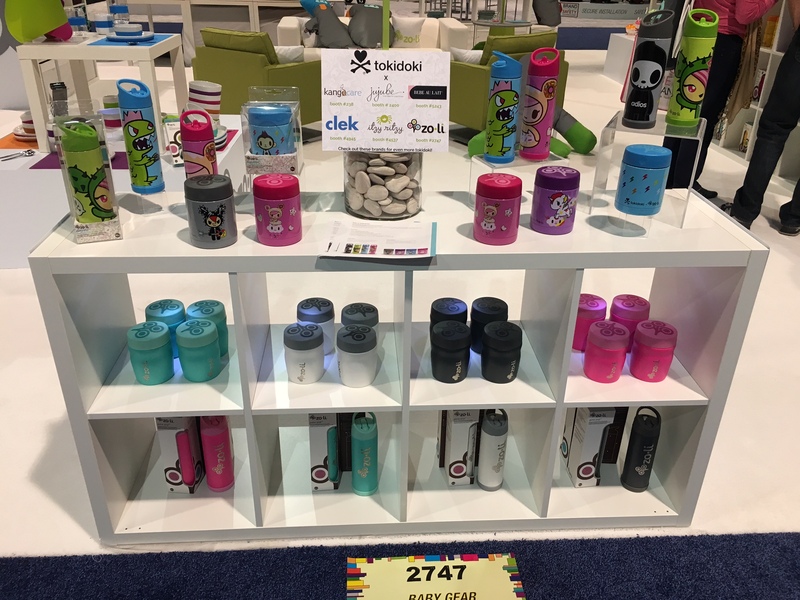 They are now bringing Sip, which is a more affordable option a slimmer design, AND some new colors! The extra wide base offers more stability, with the same functionality of insulating your hot/cold beverages on the go. 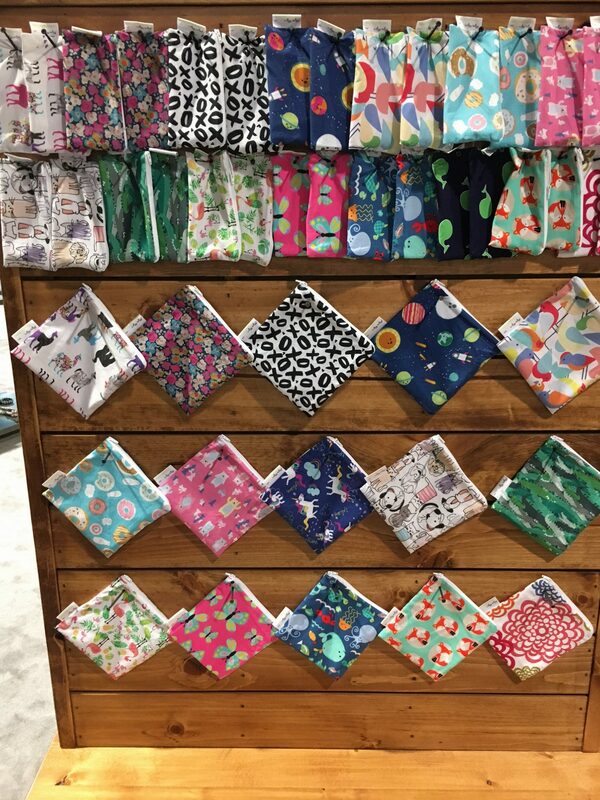 Not only was I blown away by their rustic looking booth, I was blown away with the new items Itzy Ritzy had!! 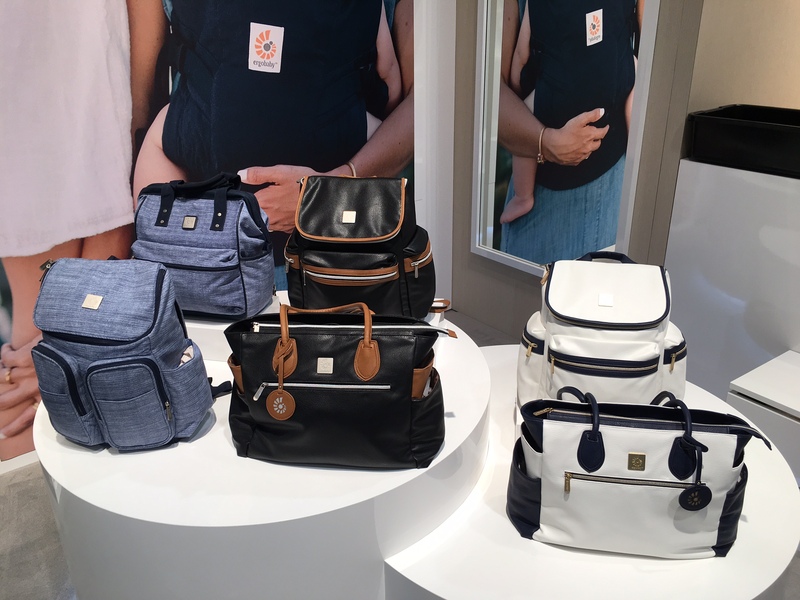 They have diaper bags! Look how pretty they are!! These will be released early 2017. Kidkraft specializes in wooden toys, from playhouses to play kitchens, they have some pretty unique items that have grown in popularity. Keep an eye out for some updates to their signature models (you can see some newbies in this pano picture I took). The world has been waiting for a bag like this. At least us Pink Ladies have been!! This little bag fits your phone, some bare essentials for a quick stroll around town (or your living room). The cutest part? It comes with an itty bitty changing pad. EEEKK! I just got eaten by a comfy shark!! Blankie tails are super comfy blankets that come in the shape of a mermaid tail or a shark. Both designs also come in kids sizes and adult sizes. I definitely didn’t pass this up to get one for myself! I know what you’re thinking… glass and toddlers don’t mix well and end up in shattered glass (and hearts too). But not anymore! Brinware has glass tableware that is coated with a silicone sleeve to protect the glass dish/cup/bowl! It’s all dishwasher safe, microwave safe, and mostly protects if it falls on the floor. YAS! This is what I’m talking about! A beautiful product, and I’m not just talking about the packaging. This line is filled with ingredients that you can cook with which are nourishing for your skin. Bonus? 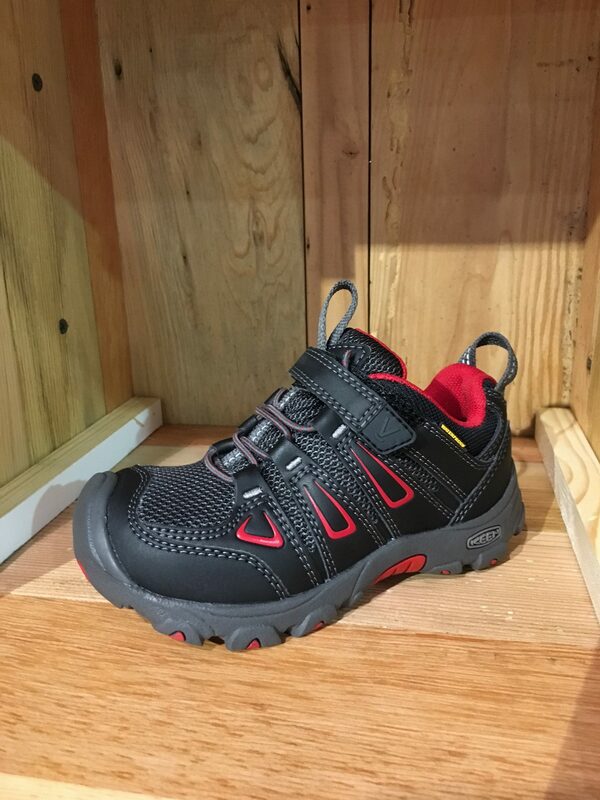 They make a kids/baby line too. 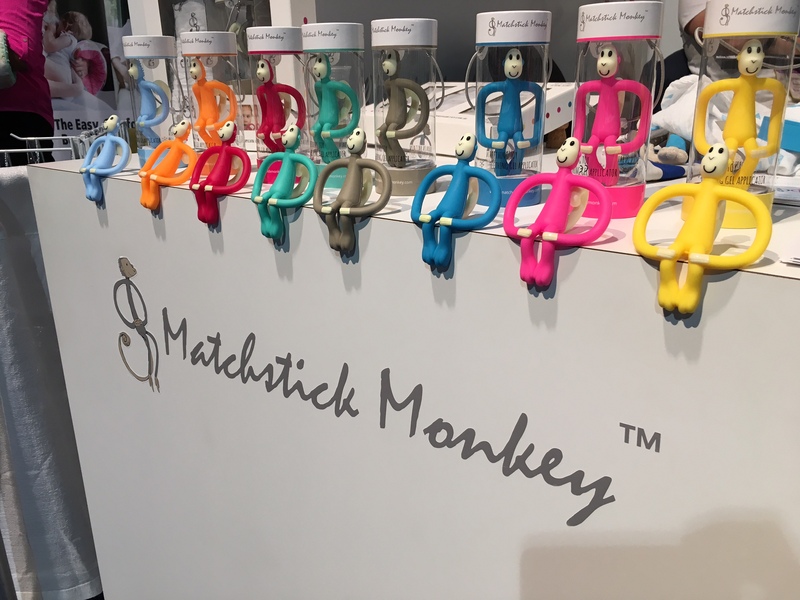 These cute little teething toys are sure to help soothe your little monkeys. It comes in an array of colors, can be used as a first tooth brush, and also aid in applying teething gel. THIS. Just THIS! A grandfather invented this to help out with his grandson’s skid marks on his underwear! They are super thin jersey strips that you place on the bottom area of your little’s underwear, and then that’s it. You throw it away once the day is done. AND, it’s so lightweight you don’t even feel it. Perfect for littles who haven’t quite mastered wiping. Here is another product I was in awe with. This is a precursor to hand sanitizer. You place it on your hands BEFORE you head out for the day and it gives you up to 6 hours of antibacterial protection! Kind of the same thing you do with sunblock for protection from the sun. Super compact and fits in anything! 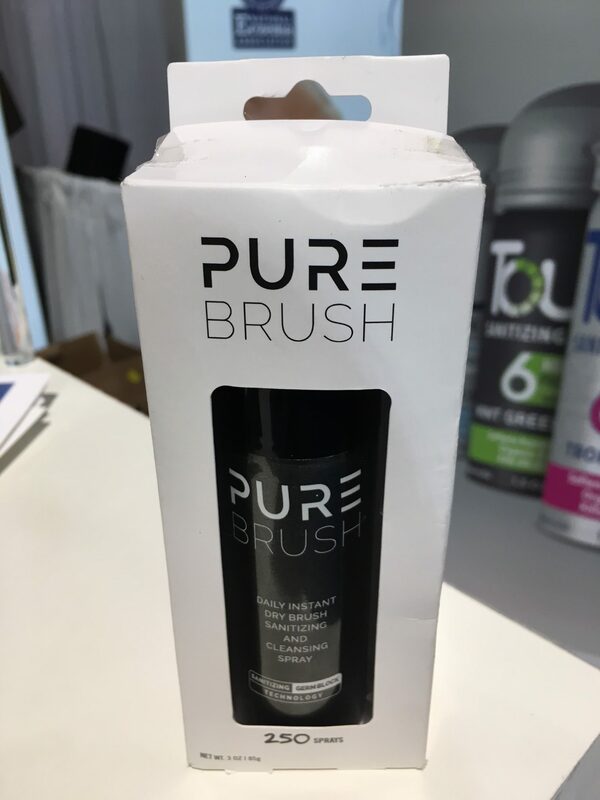 Of course I’m going to love this one as it cleans makeup brushes by spraying and wiping! AND it takes off all the bacteria and germs that can sit on your makeup brushes causing breakouts. 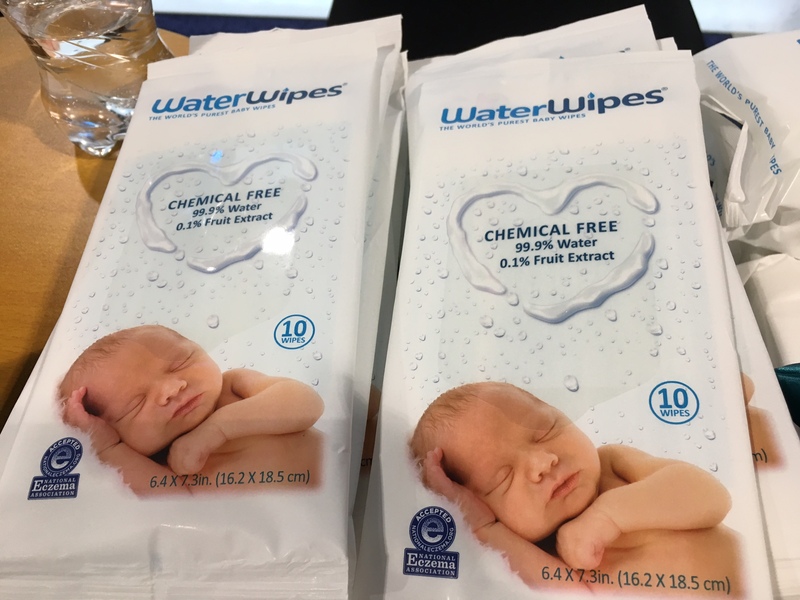 These wipes are particularly great for little ones that have super sensitive skin. 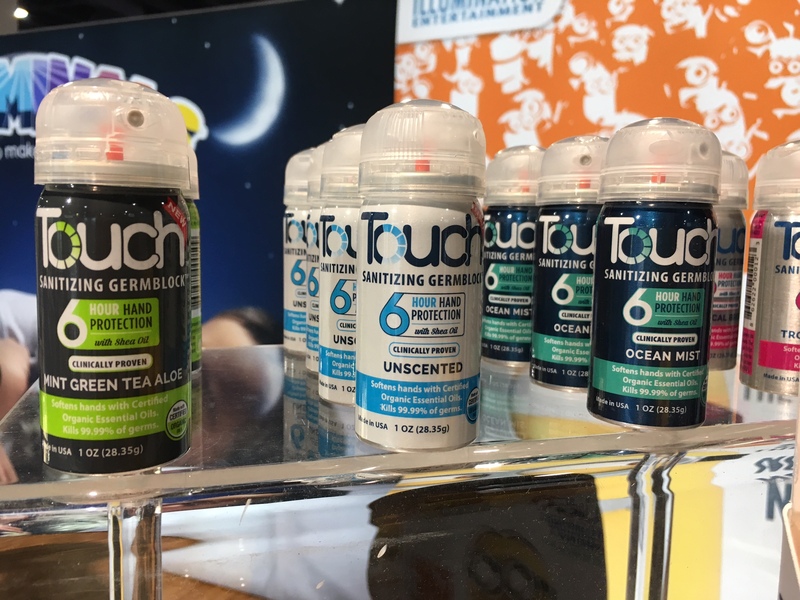 Don’t get me wrong, you can use these on everyone, but they work really well for those littles that have allergies, eczema, diaper rashes, and other skin sensitivities. It’s made from 99.9% water and 0.1% fruit extract for freshness. These compression socks come in so many different colors, and are meant for more than just those who are expecting. They come in knee-high’s and ankle socks and are great to help with circulation and swelling. Developed by an Olympic athlete. We have three of these at home and they are just awesome. They can be used on all hair types to help get the tangles out super easy. 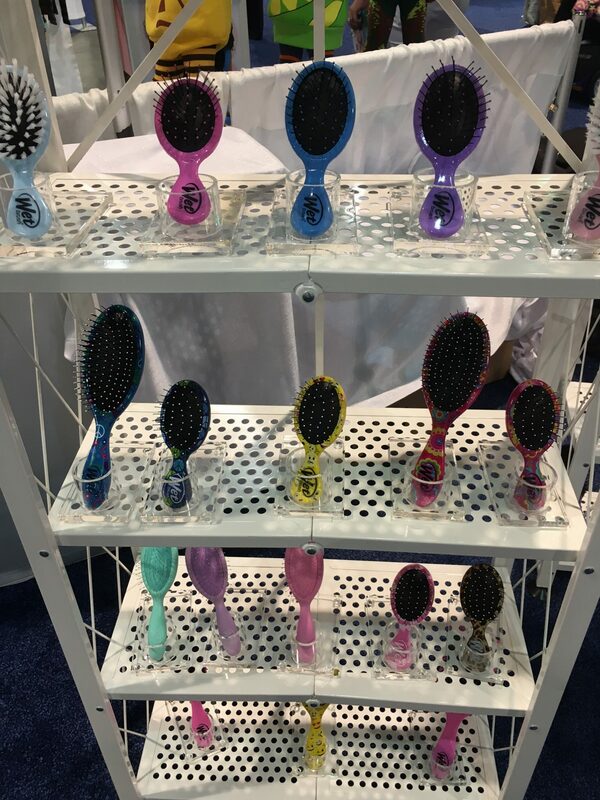 Super affordable… AND… they even have a travel brush! 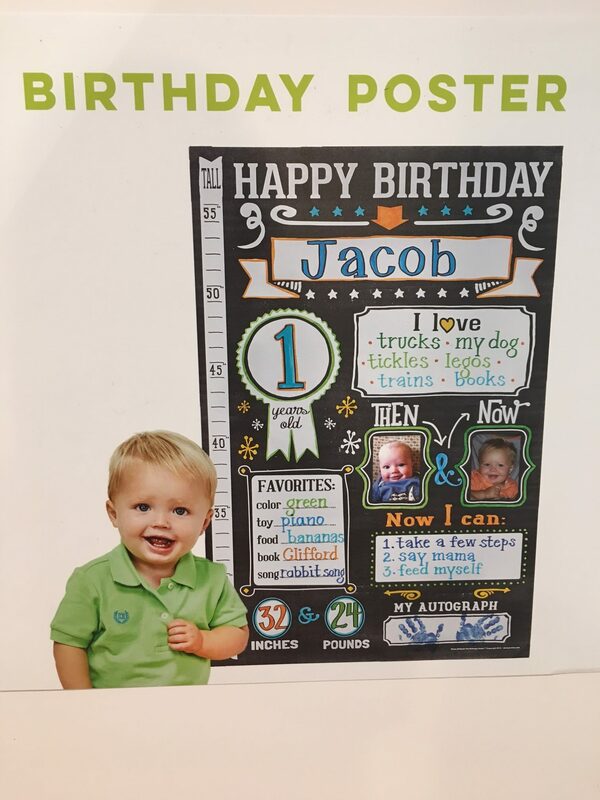 This brand has the cutest milestone markers from baby books, to photo memory cards, to birthday posters. 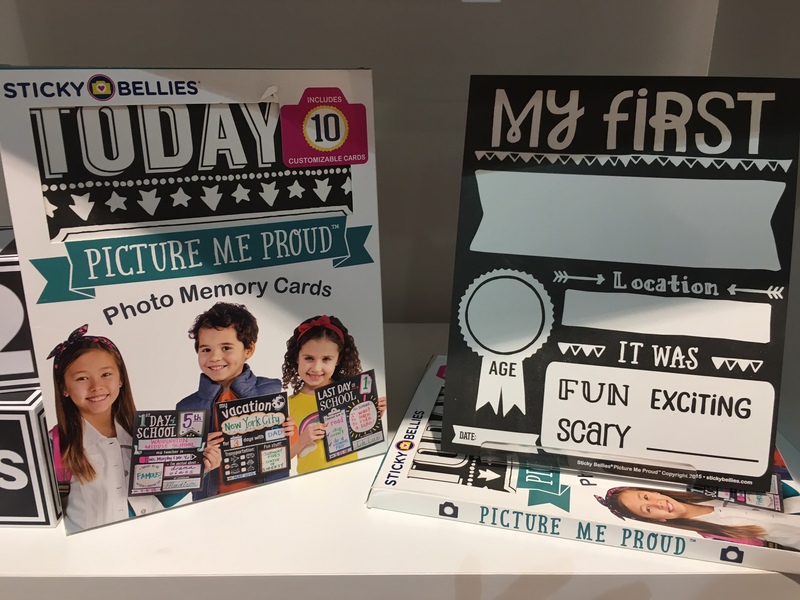 You will be set with what you need to snap those pictures of your little one’s milestones. They’ve done it again with their innovation and implemented an anti-rebound bar for their click-tight seats. This bar helps to ensure an even tighter installation and to help minimize the rebound in a frontal-crash. This bar can be added to the click-tight convertible seats pretty easily. 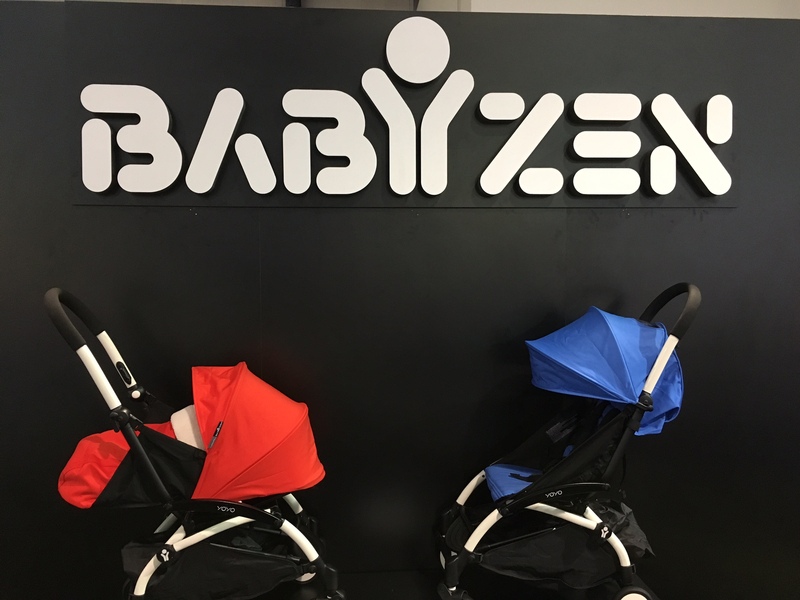 I personally have the older version of the B-Ready, and I have to say I was blown away by the new updates to this stroller! The design is super sleek, and the colors are bold and gorgeous. They updated the fold, which you can do now with either the single seat, or the second seat (time-saver for sure). This was the first time I’d actually seen the click-tight seats in action. These seats are really amazing. What’s especially attractive about these particular convertible seats, are that during the install, you don’t have to make sure the seat belt is locked! They have their own locking mechanism strong enough to simply use the integrity of the lap belt. This makes installation super easy. The Tokidoki print is starting to spread like wildfire, and it’s no surprise it hit Zoli too! Look how gorgeous these to-go TokiDINE and TokiPIP are! OMG I love it!! They’ve done it again!! Innovation at it’s finest. 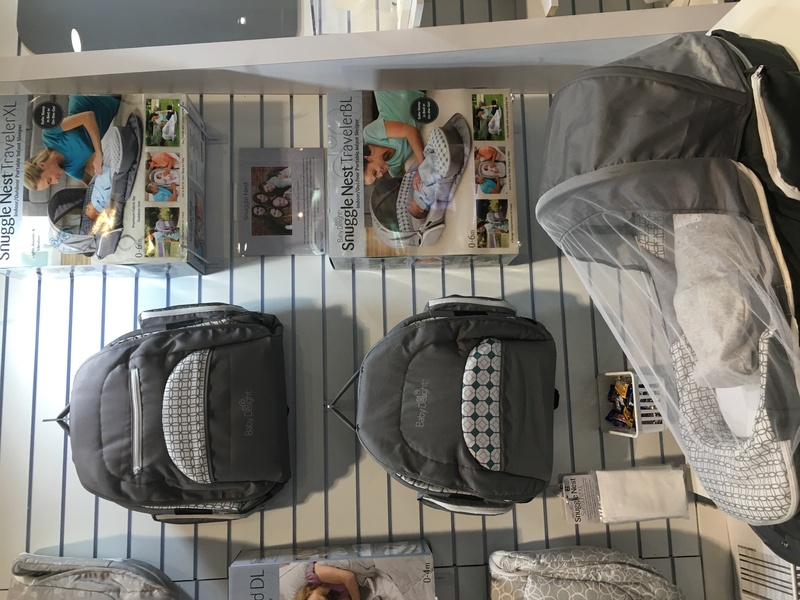 They’ve updated the Carrier One to include a more ergonomic design, mesh fabric to make it more breathable, extra padded shoulder straps, good stability in the waist belt, and is perfect for newborns! A make-up bag I can get on board with! I love this! 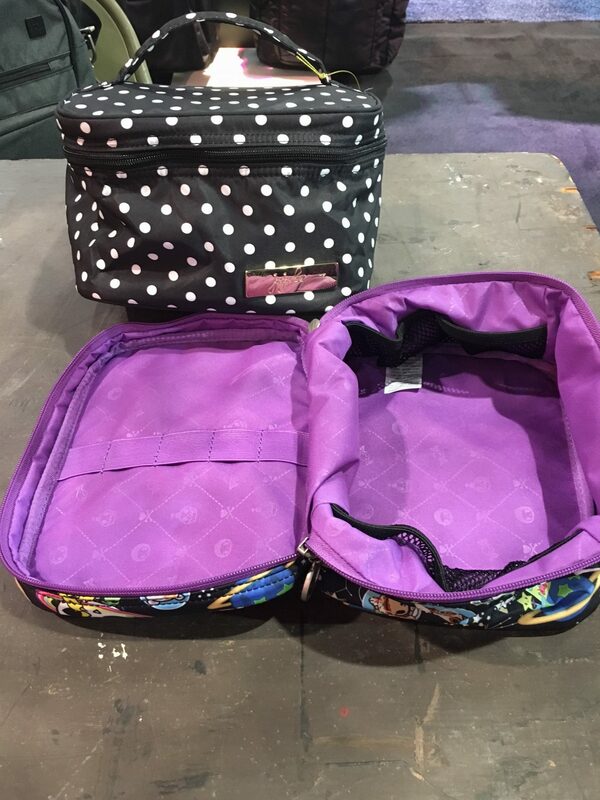 It comes in so many prints, can store all of your make-up goodies, with mesh pockets all around. It has Elastic on the top for you to store your brushes, folds flat for storage and has a zipper that opens ¾ of the bag. YES! You heard that right! 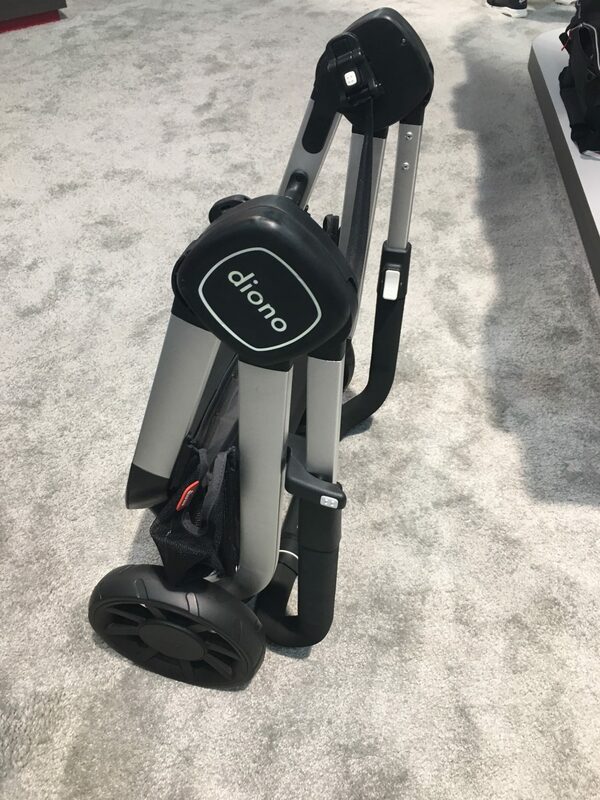 Diono is coming out with a stroller, and it’s impressive and gets released Spring 2017. 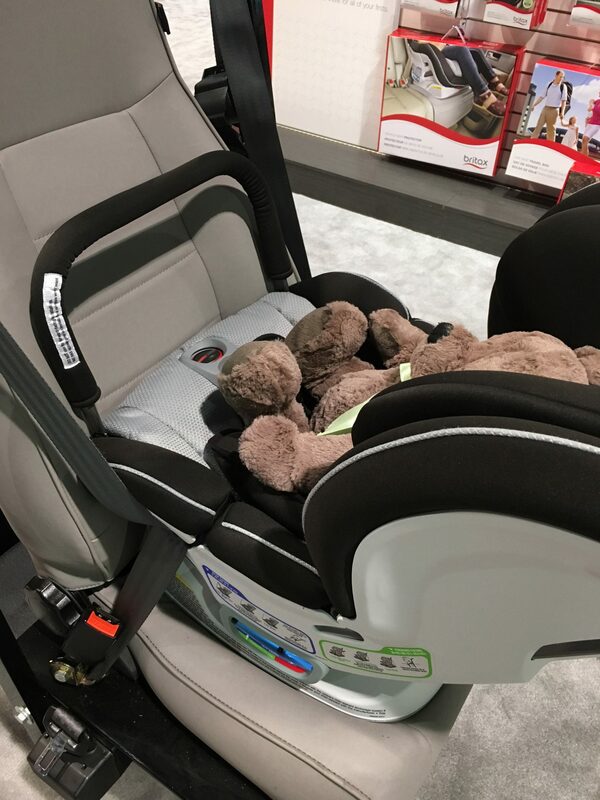 It has 7 modes that can be used, can be used forward or backward facing, holds toddlers up to 50 pounds, and the seat transitions into a bassinet and back! That was a serious wow factor for me. Which means, it can be used from infant till 50 pounds. 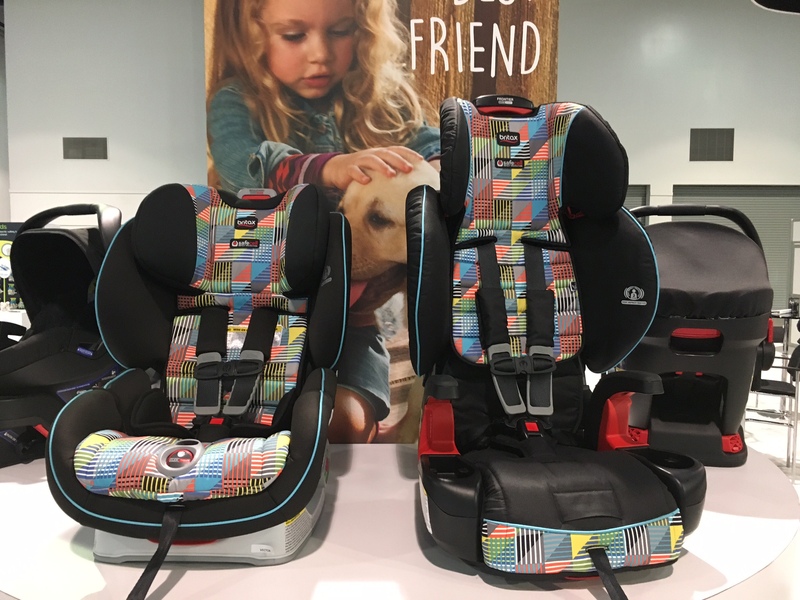 This car seat takes features from two of Graco’s most favorite seats and put them together. This seat grows with your child and also allows for extended rear-facing. In RF mode you can use the seat from 4-50 pounds, and then FF till 65 pounds, high back booster till 100 pounds, and a backless booster till 120. 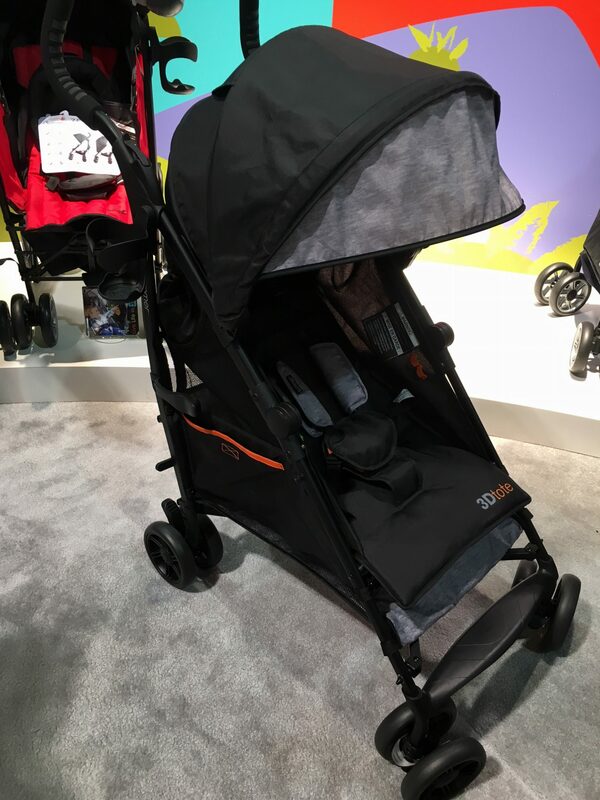 It’s the smallest stroller made by Baby Jogger. It’s only 14 pounds and folds small enough to meet carry-on requirements for almost all modes of transportation. It even comes with a carry bag that can be worn as a backpack. Check out how compact and quick this fold is. Oh YES THEY DID! 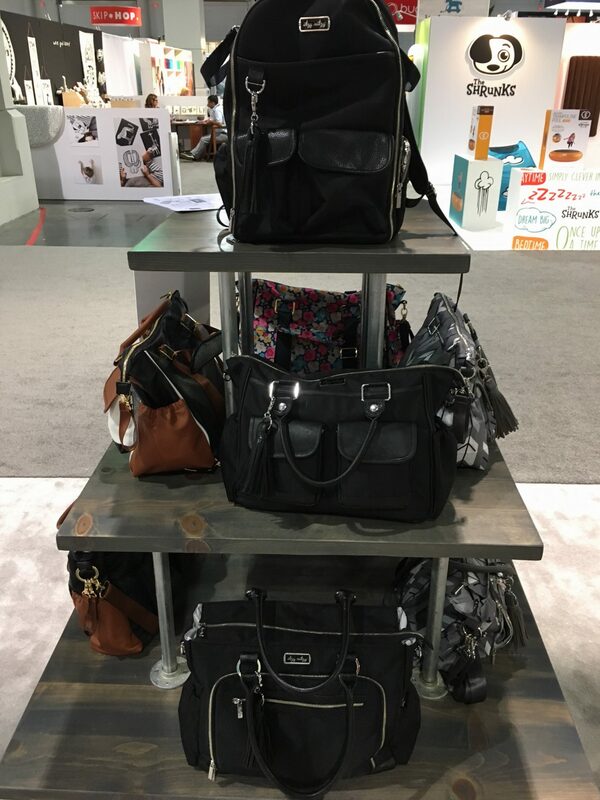 Ergobaby has now come out with diaper bags! Look how pretty they are! Keep an eye out for these in Spring of 2017. 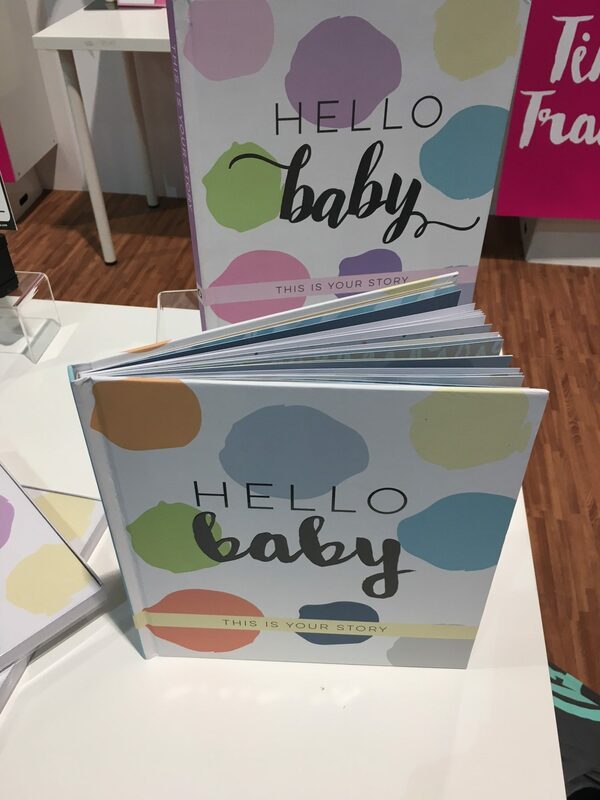 They will launch exclusively to Buy Buy Baby for the first six months. Oops they’ve done it again. 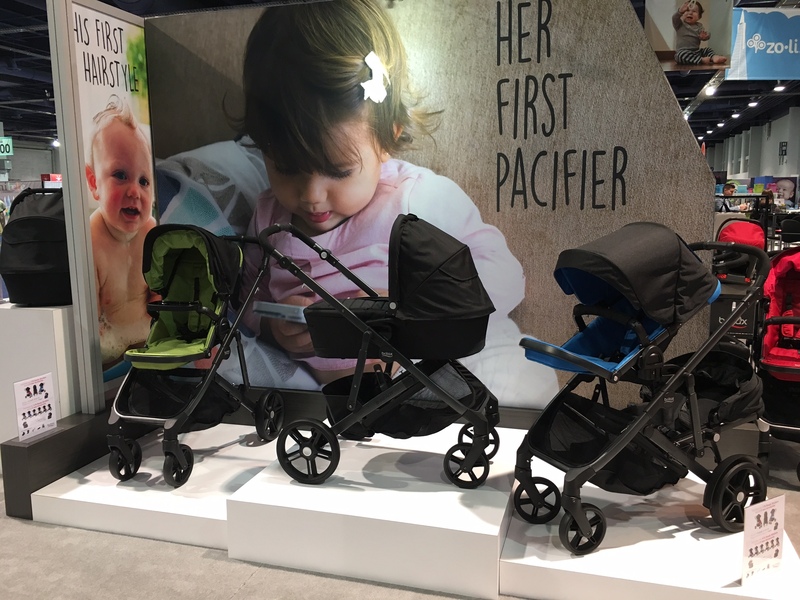 Summer Infant has been increasing their stroller line, and this time they really hit a home run. They took their ever-popular 3DLite stroller, and upgraded it. 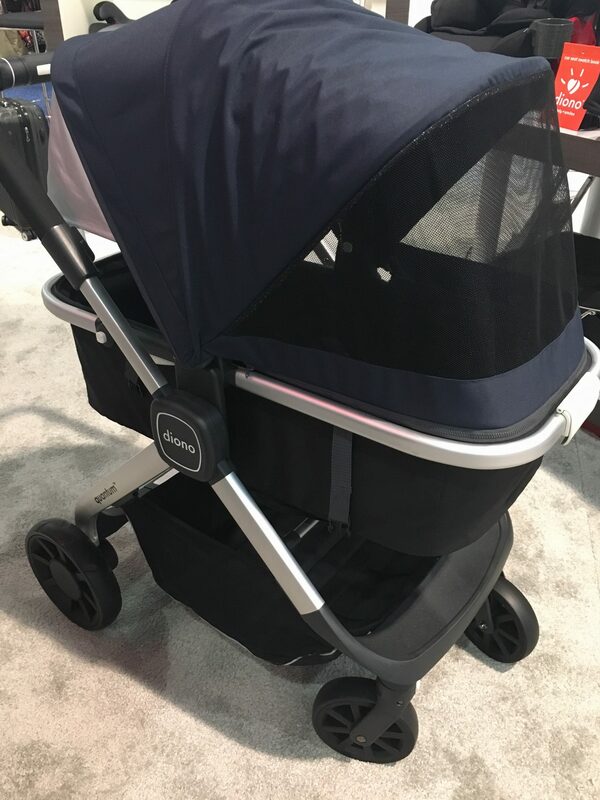 It comes with a super large storage basket, an almost full recline, AND is super stable that even with the heaviest of diaper bags hanging from the handles, the stroller won’t tip over. This booster seat was IMPRESSIVE. 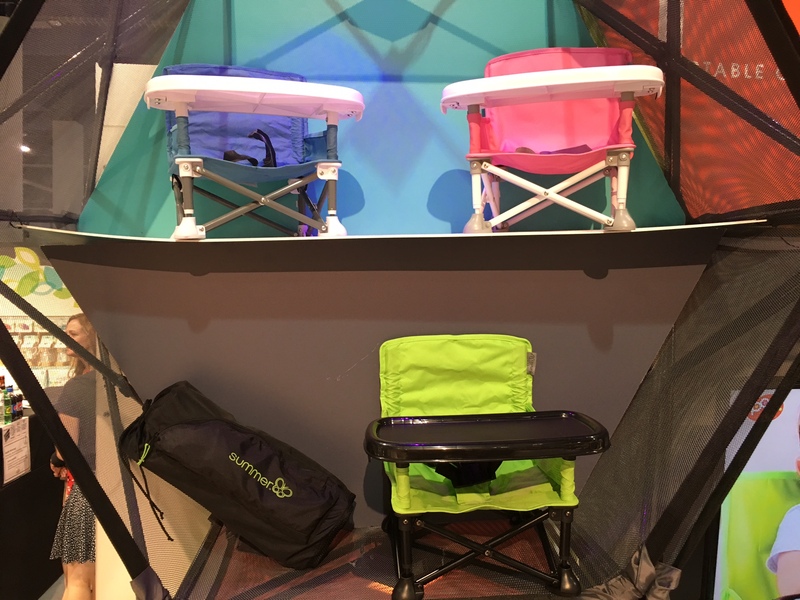 It folds compact, and is made for many on-the-go trips. It can sit alone on the floor, as it has it’s own tray, or you can securely strap it to a seat at the table. It’s very affordable too! Raise your hand if you have ever taken your monitors on a trip? 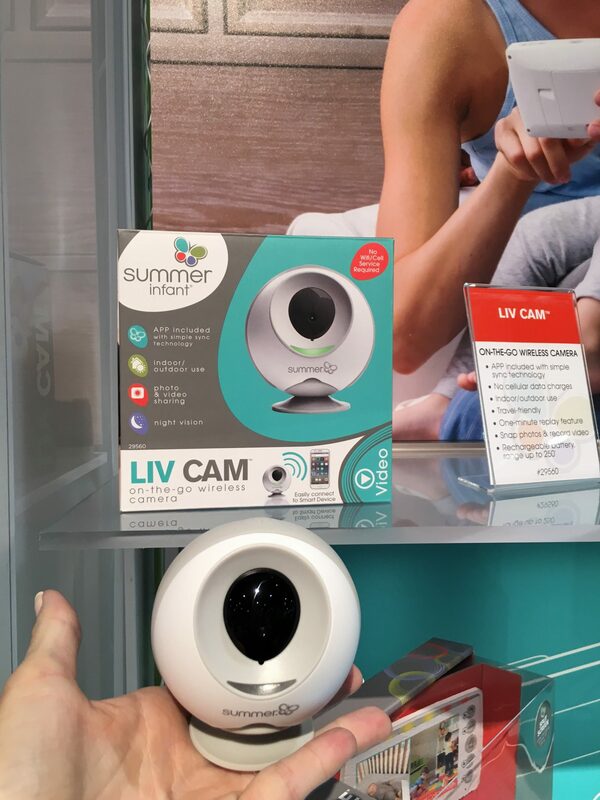 Summer Infant now has an affordable alternative to packing up and un-mounting those monitors – the LIV Cam! It’s a portable monitor that works via Bluetooth connection to your devices. No WiFi or Cellular service needed! It fits in the palm of your hand and retails for only $80!! I just learned about this brand over the past year and am in love with all of their seasonal footwear. 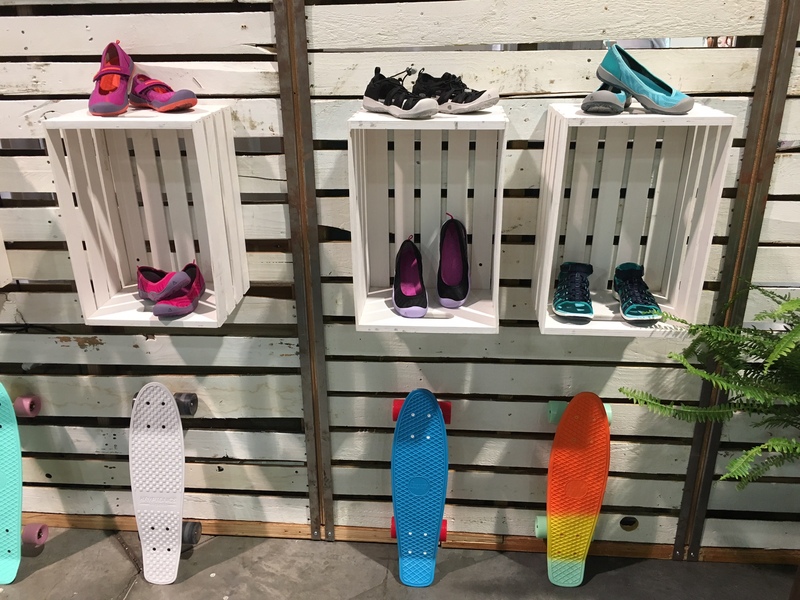 From functionality, to seasonal to affordability, Keen shoes can cater to any adventure for any foot. What a great 3-fer right? 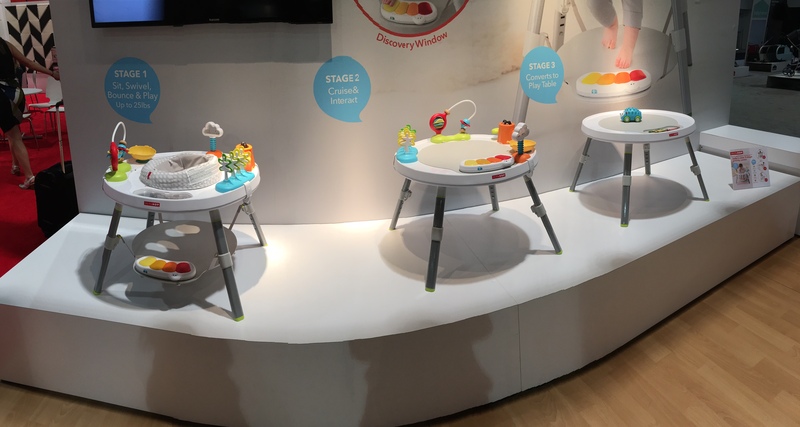 This activity center starts as a bouncer, then moves on to an interactive cruising center, and lastly a play table! It takes up less space in your home, and will last from 4 months up till, whenever you don’t need a play table anymore. Have you ever been nervous with a seat belt install? I know I have. 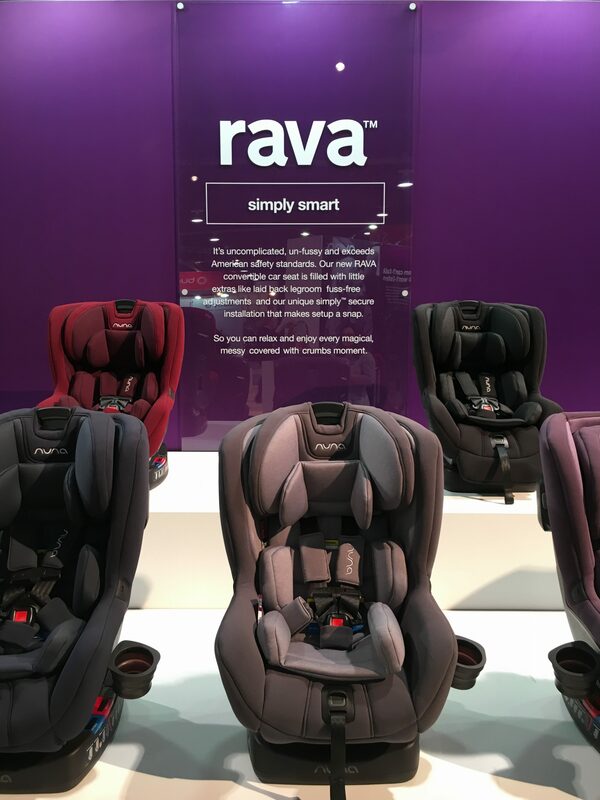 The NUNA RAVA takes the guesswork out of a seat belt install and is bubble-free. This seat can be used RF up until 50 lbs!! YAY to extended rear-facing. 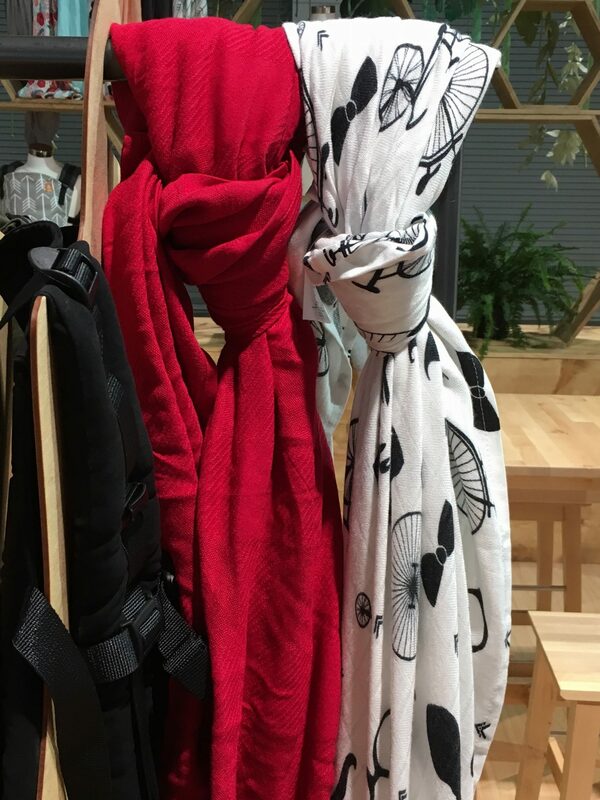 I came across this super cute brand called Urban Infant. They make THE cutest backpacks, nap mats and many more on-the-go pieces. There are tons of designs to choose from. Cute, right? Best part – they’re totally affordable. When you’re a first time mom (and even a seasoned mom), making sure you have what you need in your packed bag can sometimes be stressful. Belly Bandit has taken out most of the guesswork on all the bits and pieces you need in the hospital! 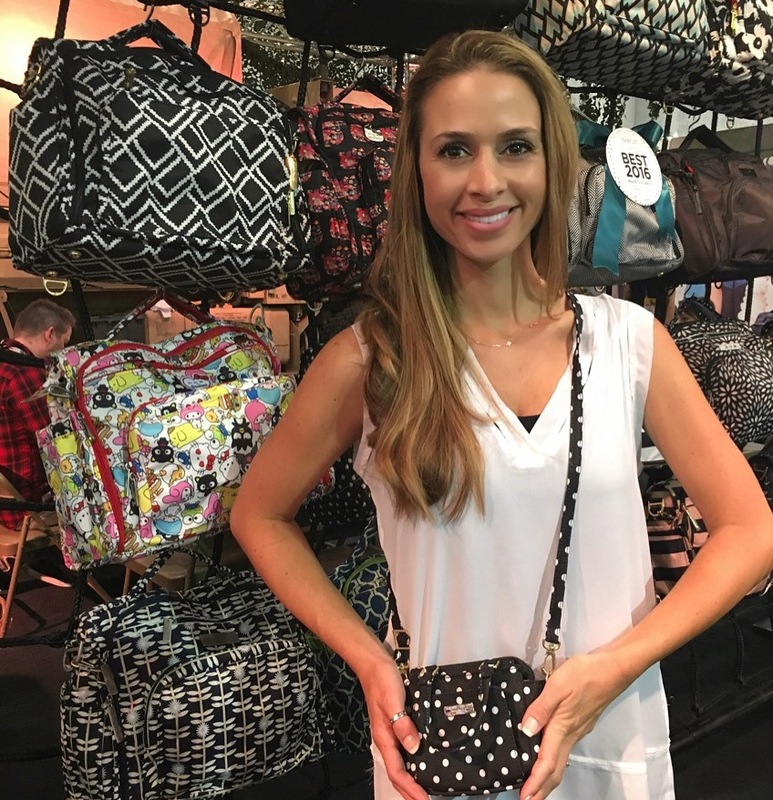 It all comes in a cute case that you can re-use as a makeup bag, or for the next time you’re headed to labor and delivery. A concerned mom invented the Snuggle Nest knowing some of the dangers associated with co-sleeping. 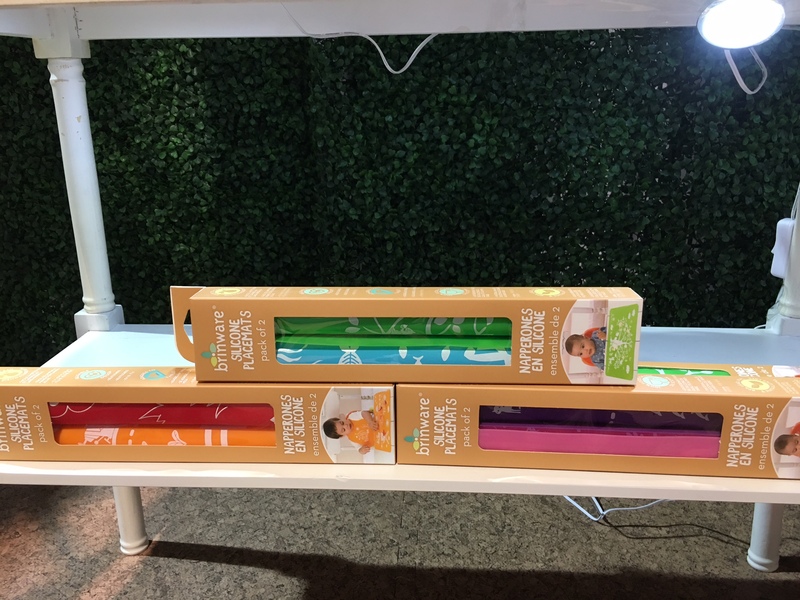 This product allows for safe co-sleeping in those beginning precious stages of life. This product can be put right next to you in bed. Wishing you some safe snuggling! 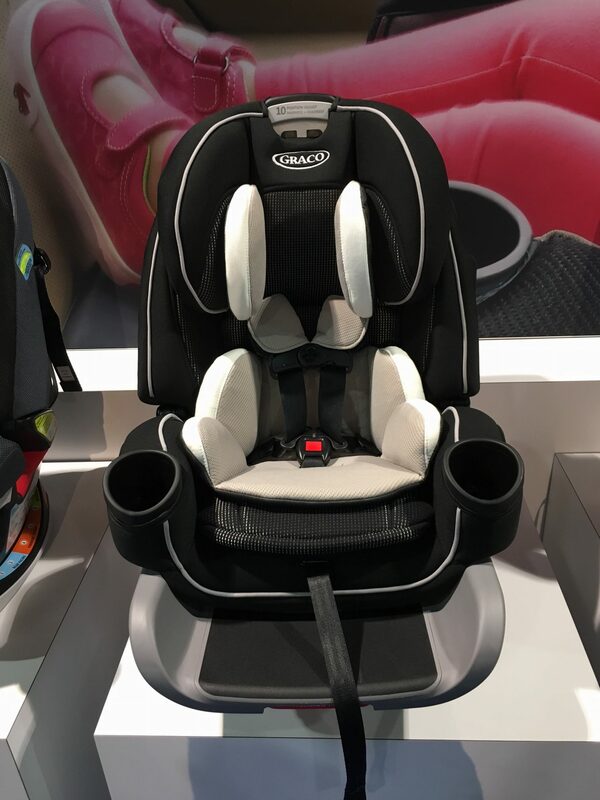 Spring is coming, and so is the Cybex Mios! It’s one of their newest strollers to hit the market. 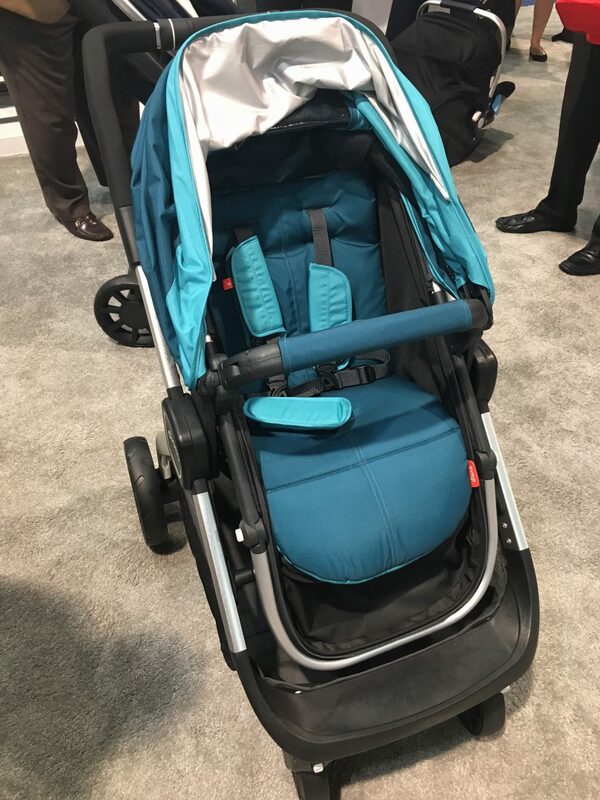 This stroller can be used from infant to 55lbs, and comes in an assortment of colors. The best part… the fold. Check out the video below. « A Week Of Good and Giving Back; Do Good Week.